Ready, Set & Artists Open Houses GO! Continue reading Ready, Set & Artists Open Houses GO! Continue reading The Secret is Out! Now open through Wednesday, 27 May! Quote of the Day: "Now . . .
Continue reading Quote of the Day: "Now . . . Obsessed with Money and Celebrity? Continue reading Obsessed with Money and Celebrity? New (Old) Work: "Seeking Harmony"
Continue reading New (Old) Work: "Seeking Harmony"
... because if you haven't seen this, I want to share it with you. My October workshop was a full house with two first time beginners and two returning artists looking to develop their work further. I am so very pleased to have their permission to share their work with you! 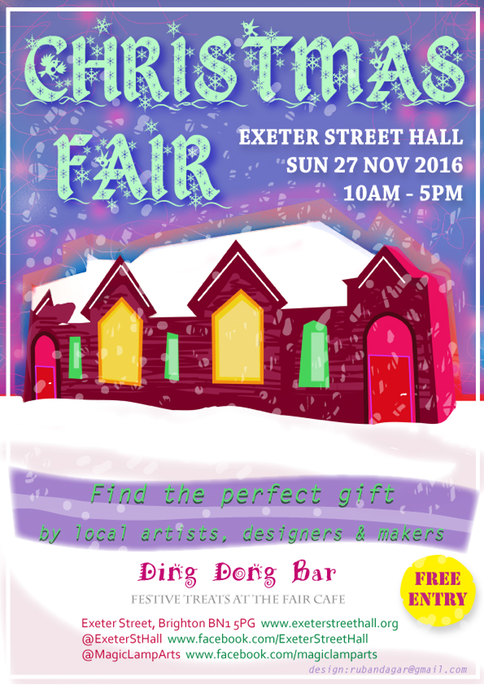 My one and only Christmas Fair appearance this season will be in Brighton on Sunday, 27 November. Follow the links below for directions on how to find it and I hope to see you there! I have donated one of my works, “Cottage by the Sea - 1” to the Big Heart Auction 2016. All money raised during the online auction was split between Chestnut Tree House (80%) and Brighton Dome & Brighton Festival’s Umbrella Club (20%). 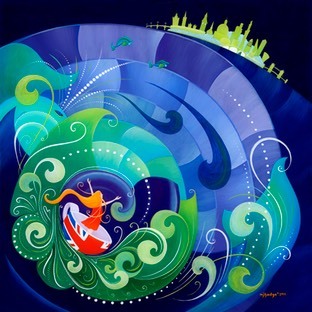 Chestnut Tree House does vital work caring for children with life-limiting illnesses and supporting their families across Sussex while the Umbrella Club keeps them all smiling with live art experiences. More information about Chestnut Tree House can be found here. Please click here for auction details of my donated work. The auction itself was held online, via eBay, and raised a total of £38,500 - equivalent to running 5 days of respite services and care at Chestnut Tree House and in the homes of the children they support. In the run up to the auction going live, a series of pop-up exhibitions took place across Sussex. 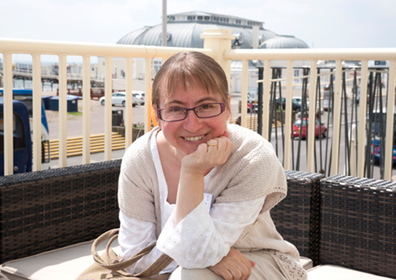 As I’m always happy to sit in the sun by the seaside you can see a rare portrait of me below, taken by the friendly Graham Franks of grahamfrankspics.co.uk at the Worthing Dome exhibition. The main exhibition, featuring ALL donated works, was held at the Brighton Dome from 1-5 July. Right: My donation to the 2016 Big Heart Charity Auction, "Cottage by the Sea - 1"
While I am fortunate enough not to have a child with a life threatening illness I do know how fragile and temporary this state might be, and I can promise you that these charities are doing hugely important work as they support families trying to meet the practical needs of their children while at the same time keeping the laughter bubbling. For this reason, I really do hope that you will look out for next year’s Big Heart Auction and join in the fun and excitement of bidding to support the work of these fabulous charities! It was chance and my good fortune that I was born into a family that could look after me, in a country that offered security, with the means and opportunity to follow my dreams at every step. I know that not everyone is so lucky and with every refugee who dies while seeking the security, stability and safe future for their children that I still too often take for granted - I feel the loss of their dreams. The children, whose dreams should shine the brightest, are the greatest loss of them all. Physically I can not go and save them. I have children of my own who need me. But I want to do something. I have made donations to charities and charity appeals that work with refugees in a variety of ways over this last year and a half, offering my funds so that others might support those in need and give practical assistance where I can not. But I can not give all of my resources to save them, even though the desire is sometimes overwhelming. Particularly at this time of many crossings, as the Mediterranean death toll rises with every hour and every news report. I have swum in the Mediterranean. My spiraling stars were born on a night looking out to sea off the coast of Italy and losing the place where the Milky Way ended and the reflection of far off galaxies began. When I stood at the edge of a promenade and could not sense the beach below me, nor tell which lights in the middle distance were from ships at sea, from the stars above or from the reflections below it felt as though I was standing in the middle of the universe, that the world was full of magic and that anything was possible. I think of that night now and it is shadowed by recent news reports so that even in the peace of my memory I sense the lost, the desperate and the afraid hovering at the edges of my awareness. They too may well be looking out into a dark sky tonight, from the middle of the Meditteranean, unable to tell where the night begins, the sea ends and a safe haven lies; uncertain of which lights are ships offering rescue if they can only stay alive long enough and which lights watch over them from a hundred light years away. I painted “Storm in a Teacup” over a year ago. It was a playful attempt to describe my own migrant experience. Born in the States and yet always slightly ‘other,’ I was able to travel and find my own future in this land beyond the Atlantic. I travelled with airline tickets, passport and funds to keep me fed and warm at night. I feel fortunate to have been so lucky and yet, if anything, my good fortune heightens my sense of injustice as I watch other mothers, other daughters, seeking to find their own paths and meeting hardship and loss every step of the way. And I want to do something. No matter how small and insignificant it might seem when I look at the big picture I want to do something that is manageable for me, within my means, which can continue over time and which might be, maybe, just enough to ease someone else’s journey, save someone else’s life, feed a child’s hopeful dreams. For this reason I am promising that 20% of all my Fine Art Print sales from this summer, and longer if needed, will be donated to support the 2016 Mission of the MOAS Migrant Offshore Aid Station as they continue their off shore search and rescue work in the Mediterranean. I hope you will join me in doing something to help. I’d like to say it’s magic, but the truth is that it takes time, patience and money - and the magic is only in the final result. As such, I’m not terribly precious about the secret of my success and as you have enquired, I’m happy to share the process. It is time consuming, meticulous and demanding work - but I love my media so I don’t worry about all of that and focus instead on the peace of mind such absorbing concentration brings. This can not be underestimated. I have a very good professional photographer I use, who regularly complains about the difficulty of photographing works on glass and yet he invariably rises to the challenge with spectacular success. All of my images are digitally photographed and instantly brought up on screen in Photoshop. Getting a pure image unaided is impossible as there will always be a speck of dust or a line of refraction that needs tweaking. I am not embarrassed to retouch the images, because the result is a Fine Art Print worthy of the name and that truly does justice to the original artwork. For this you need A GOOD EYE. Each digital image is checked on screen and then checked again for quality and colour once printed. This can take half a dozen trial prints to get right and I have been called ‘overly particular’ more than once. But it pays off. I am proud of my prints and happy to put my name to them. And for those three things you need MONEY. Tech, equipment, checking and double checking all costs me money. Plus paying that little bit extra for the best archival paper, using only archival inks and, for the larger prints, going for full gloss as it brings out the richness, depth and vibrancy of the original colours to best effect. Then, when the prints are ready it takes THE FINISHING TOUCH. I use only archival quality mattes and backing boards to protect and display my prints and all mattes are custom cut to show off the artwork at its best. 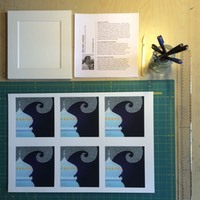 Before packaging them up though, I sign and number each print by hand with care, add in an Artist/Print information sheet which doubles as a Certificate of Authenticity and, for larger prints, include a customised label for each print which can be put onto the back of the framed work. And all of this takes LOVE. It is only then, when every piece has been put into its individual cellophane sleeve that carefully fold over the plastic, line up the edges carefully and seal it with love. 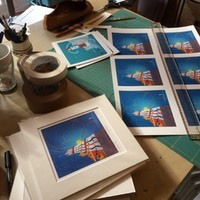 Fine Art Prints may seem like a manufactured and mass-produced thing in many shops, but I promise you that I have touched each and every print, at each and every step of the process, often many times over. I love what I do and the work that I make, and if you like it too and are willing to invest in me - then you definitely deserve the very best artworks that I can offer. For more about the prints I have available for sale please visit my online shop. 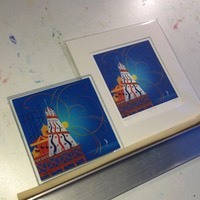 Orders can be placed by email or phone and I am happy to advise on framing options when you buy. Payments can be made via bank transfer or Paypal, with the latter option allowing payment via credit card. Original artwork is also available for sale and I will accept payment in installments. Coming up next (after my Brighton Artists Open Houses adventure is over and Amberley Museum’s Traditional Craft Fair has come and gone) will be the Burgess Hill Summer Festival and the opening of the annual Burgess Hill Artists Summer Exhibition! The exhibition will officially begin on Saturday 4 June when the pub opens at 12 noon and run daily from 12 noon to 11 pm when the pub closes. We will be holding our MEET THE ARTISTS event on Saturday 11 June from 3 - 4.30 pm. Please note that this event is NOT in the Festival Guide so please mark your diaries NOW! As part of the Festival I will also be running a Drawing Outdoors workshop for adults on Thursday 9 June, and another BHA member, Holly Sellors, will be running a Painting by the Pond session for all ages on Saturday 11 June, finishing an hour before the Meet the Artists event starts. BHA mosaic artist, Susan Driver, is also running Open Studio events on Friday 10 June, Saturday 11 June and Sunday, 12 June. For a full listing of the Burgess Hill Summer Festival events please click here. Information on my events can be found on pages 4 and 11, with booking information on page 3.
and this is just a quick summary to share the journey with you so far, as it ain’t over yet. 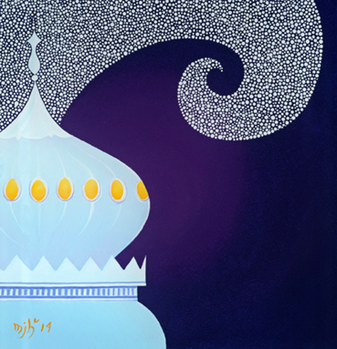 In February I confirmed my place in The Magic Lamp (Facebook / Website) for the annual Brighton Artists Open Houses. It was hugely exciting as participating in one of the largest Artists Open Houses in the UK has been a slow-burn project I finally felt ready for. 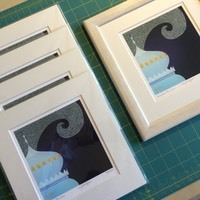 In March I took paintings to be framed, arranged for new photographs to be taken of my Brighton Dome work (below) and ordered my Fine Art Prints, custom cut mattes and related packaging supplies. I have spent April collecting artwork, supervising the printing and putting them all together for display. While this admin was going on I was also nursing my daughter who had suffered a concussion after a fall and writing the background info on my son’s EHCP plan (for those not in the know, that means I was making the case for his special learning needs and social support as he becomes a teenager). Both of these parenting roles have been extremely challenging and have taken up a huge amount of my creative time and emotional energies, as a result I have not lifted a paint brush in nearly two months as I type this. That said, having The Magic Lamp to look forward to has kept me engaged with my art in a new and different way and kept me motivated during some of those harder days. So, when I say that I am so excited to finally be here I mean it with all of my heart because it means I’ve done it! Nursed the children, fought their side, taken care of myself AND coordinated my orders, photography and print runs so that I am ready for Saturday morning when The Magic Lamp opens at 11 am (though I’ll be taking the train down so won’t arrive until 12.30 ;). By which time, I hope to see you already there! I’ve even had time to bake some American style brownies to share with early bird arrivals! "Brighton Pavilion” is the newest in my Sussex Series. For details on ordering a copy of this as a Fine Art Print, please click here. For price and availability of the original artwork please email me. If you’ve read Ready, Set & Go you’ll understand when I say THIS page is a work in progress! 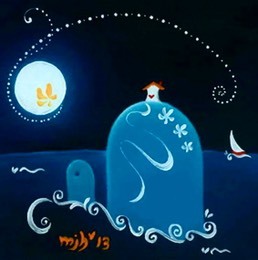 It is coming though and when it does, it’s going to be a real treat as I’ll be featuring and sharing the work of some of the Croatian Naive artists who have had, and continue to have, a massive influence on my work and creative practices. These are artists you will struggle to find online - but once you’ve seen them you won’t forget them. So, if you haven’t signed up to my newsletter yet DO IT NOW. The Mailchimp form is on the bottom of my contact page and it really is as easy as 1, 2, 3. And as soon as I’ve got my Naive act together, I promise, you’ll be the first to know!